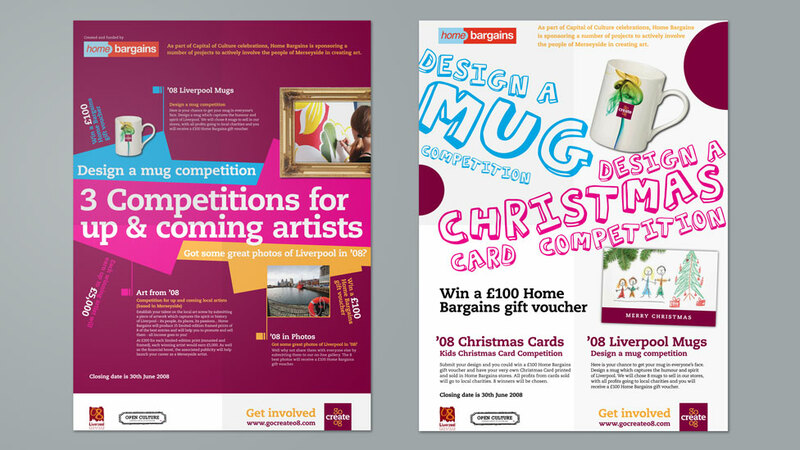 As part of Liverpool’s Capital of Culture celebrations in 2008, high street retailer Home Bargains hosted a series of competitions encouraging the people of Merseyside to get arty! Parker Design developed the competition branding campaign to promote the various projects. The competition covered a variety of themes, from photography to painting, Christmas cards to mugs and even a huge tapestry (Bayeux eat your heart out! ), there was something to appeal to everyone and all ages. To hang the various elements of the competition branding campaign together the first port of call was to create a logo and brand which could feature on all promotional materials. Having created a range of initial concepts the final logo for ‘Go create 08’ is simple but striking, making clever use of symmetry to create a very distinctive brand. The competition branding campaign spanned a wide variety of initial promotional material to get people involved, including posters and portable displays to be showcased in the Home Bargains stores and vehicle livery for the fleet of Home Bargains lorries. To help with the logistics and running of the various competitions we designed and built a bespoke website containing all the details for the various competitions, including rules and regulations. We also built in the functionality for people to submit their entries online. Literally thousands of entries were submitted over the course of the competition and these were all managed by Parker Design through the website. Further materials were produced as the competition branding campaign rolled on including a printed winners brochure, featuring all the winners names and winning entries compiled into a beautifully designed brochure. We designed an invitation to an exclusive winners party, hosted in a top Liverpool restaurant where a limited run of framed winning prints were auctioned off for charity, raising approximately £40,000 for local charities and £40,000 for the local artists. It goes to show that a fantastic concept can be completely brought to life through a great competition branding campaign, and really capture people’s imaginations. 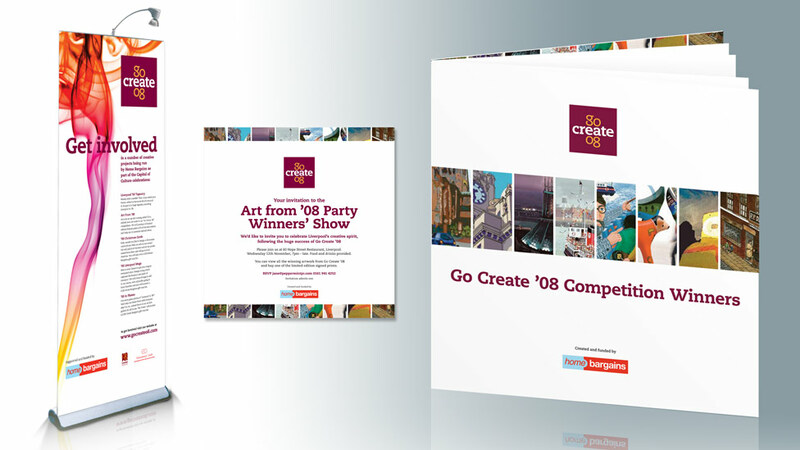 Having created a strong visual identity for the 'goCreate08' competition run by Home Bargains, they needed further competition promotion in the form of printed leaflets detailing the art projects sponsored by the retailer. AstraZeneca operates in an information-rich industry, and the organisation considers information to be the life-blood of the company. So the way imformation is found, sorted, used, stored and protected is vital to the success of the business.